India's southern Kochi city is home to an airport completely powered by solar energy. Winner of the U.N. 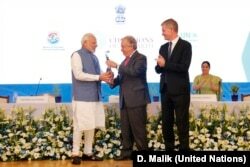 Champions of the Earth Award for Entrepreneurial Vision in 2018, the project is testimony to India's ambitions to rapidly scale up solar power to cut carbon emissions. Prime Minister of India Narendra Modi receives the U.N. Champions of the Earth Award from U.N. Secretary-General António Guterres along with UNEP Chief Erik Solheim, right. The award ceremony was at the Pravasi Bharatiya Kendra in New Delhi, Oct. 3, 2018.